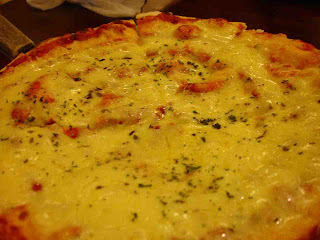 Whenever we go to Tagaytay, we always dine at Carlo's Pizza. We would've preferred dining al fresco but decided against it since we have kids in tow. 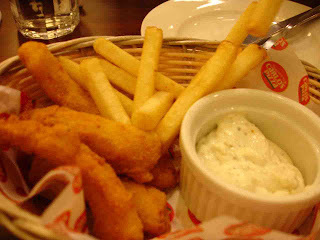 This is our usual order at Carlo's Pizza-- Fish & Chips although now, they call it fish and fries. I guess some have a hard time adjusting to potato wedges. Even the garlic dip was so yummy! Daughter finished the lot all by herself. Cheese pizza. I love the seafood pizza but sadly, it was not on the menu anymore. The kids outvoted us by ordering cheese pizza. Still delish nonetheless! 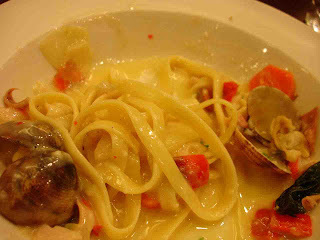 We were so famished by the time we arrived at the pizzeria and gladly dig in to the pasta. Luckily, I remembered to take a photo before it totally vanished. Yum yum!! !